The evidence is inescapable that the left is rising up as one and engaging in a civil war against conservatism. It’s cynical, calculated and supported by the Democratic Party. The reason Mastercard and Visa gave us for cutting us off and thus sabotaging our online fund-raising operation is that the SPLC told them that we were a hate group. It is wrong to focus on the Tech heads as the culprits because as businessmen they have a vested interest in keeping their platforms politically neutral. They have been threatened by Senator Mark Warner and other Democrats if they don’t censor conservatives. 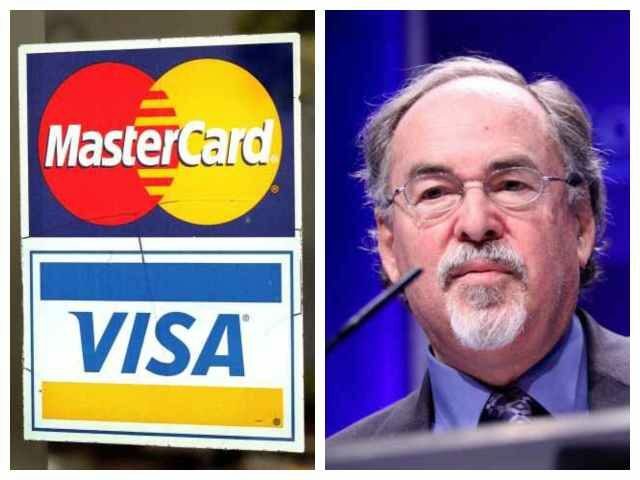 The fact that Mastercard and Visa are now part of this juggernaut indicates how dangerous this has become. We are seeing the left using its positions in banking and technology to attack us. Richard Spencer, Dennis Prager, Breitbart News, David Horowitz, the National Rifle Association, all of Alex Jones’ offerings, all are being systematically removed from their ability to raise money and continue operations. This is the danger we are coming to, folks. The left is declaring full out warfare against anyone who does not agree with them. They are using every illicit method to shut down conservatives from biased tech giants deploying their power to destroy center-right opinion on the Internet, now to the whole system of finance being turned against us and used as a weapon to eliminate the freedoms and livelihoods of conservatives. Liberals are pulling out all the stops and using every weapon to attack us, now. If you are a Republican or a conservative, your very jobs are at stake. Liberals want you either to conform to their left-wing, un-American policies and ideas or they want you utterly shunned from every area of society. It is no less than a full-blown civil war that they want.